February is certainly turning out to be another great month for new iOS game releases. This week we got another strong digital board game port, an excellent adventure game, some really creative arcade and puzzle games and lots more to choose from. I’ll kick off this week’s coverage with Happymagenta, who just released another free-to play title. Already honored as Apple’s Editor’s Choice, Tomb of the Mask is a fast action, endless survival arcade game. 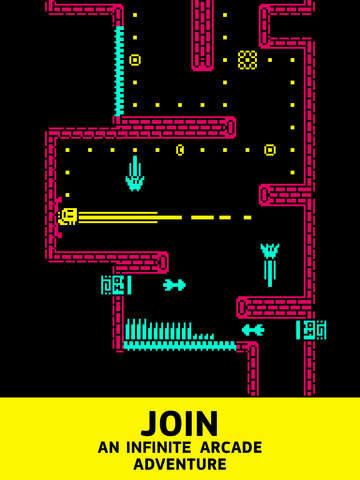 Players make their way onward and upwards through a procedurally generated vertical maze, avoiding traps, other obstacles and constant impending doom from below. Players use swipe controls to move about the maze; Swiping up, down, left or right to propel themselves in that direction until they meet a wall; utilizing the walls to stop movement and switch directions. Just make sure you don’t swipe yourself into a wall covered in spikes! Tomb of the Mask features a monochromatic 8-bit art style similar to that of Downwell and classic CGA PC and Atari games. Another of those one more try high-score style games, this one should have you hooked for a good long while. Colibri Games has two new releases this week, the first of which is a fairly brief, but mysterious point and click adventure game called Abandoned: The Underground City. 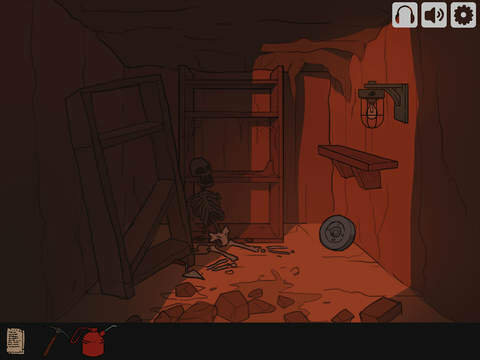 It is a classic style adventure game about parallel worlds where residents have just left and abandoned them forever. 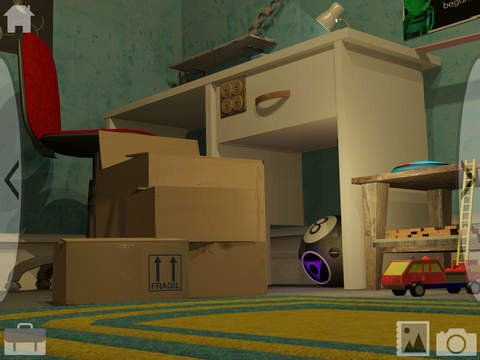 You play as a man searching for his long lost brother “who dedicated his life to finding out the way to Abandoned”. As I mentioned the game is pretty brief, but has some nice potential should Colibri decide to develop it further. The other big news from Colibri this week is that they’ve ported their hit 2012 adventure game The Tiny Bang Story to the Apple TV. In this game players attempt to solve puzzles and restore Tiny Planet after it was hit by a meteor. Available in a new $2.99 Apple TV app, the game looks gorgeous on the big screen and navigation using the Siri remote is simple and intuitive. To find it just search for “Tiny Bang Story TV” on your fourth generation Apple TV. Next up is Abzorb, a brilliant new tilt-based arcade/puzzle game by Gerald Kelley, the developer of 2014’s Dudeski. In Abzorb it is a race against the clock as you are trying to consume all of the blue orbs by tilting your device to move your pointer as close to them as you can without actually touching them, while also evading the time-stealing red orbs. 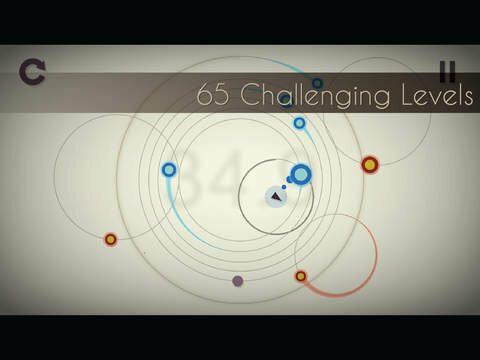 As you make your way through the game’s 65 levels, new gameplay elements are introduced which ratchet up the challenge and the fun. Some orbs will shrink you, while others will make you grow, making it more difficult to avoid the red orbs or other dangers. This is a great game, with very responsive tilt controls. I think fans of games like Tilt to Live will certainly want to check this one out. That being said, I want to be clear that this is not a Tilt to Live clone, that was a survival arcade game, this is more of a puzzly arcade game. 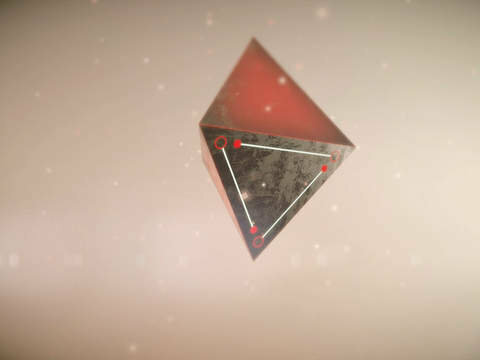 Shockingly developed by just one person (Clint Siu), _PRISM is a beautiful and tactile, geometric zen puzzle game. Players are taken on a “visually stunning journey through a microcosmic galaxy” as they touch, tap, twist, push, pull, fold, unfold, pinch, rotate and swipe to manipulate and transform geometric shapes and uncover more shapes and glowing balls of energy and matter below. _PRISM is a refreshing, serene and engaging puzzle game that is not to be missed. One of the big surprise standouts of the week for sure. As I’m typing this I handed this game to my 8 year-old and she is completely and totally engrossed in the game (just as I was) and requires very little assistance from me to solve the puzzles (at least until the later levels). 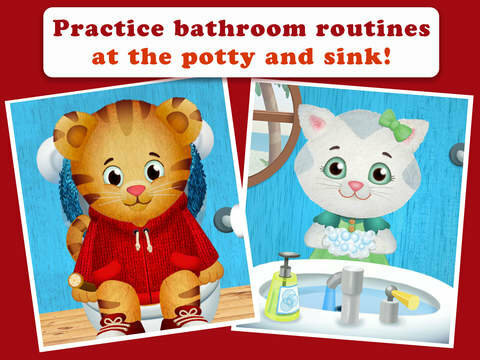 For the little ones this week, PBS KIDS has released a new app featuring Daniel Tiger and his friend Katerina Kittycat, aimed at assisting your child with potty training. Daniel Tiger’s Stop & Go Potty helps instill your child with proper bathroom routines like wiping, flushing, and washing & drying hands before returning to play. Play games with Daniel and Katerina and when the character starts to indicate that they need to use the potty, the child learns that they need to stop and go right away. It looks like a fun way to help kids learn an important lesson without embarrassing them or perhaps them even realizing that they are learning. Glitch Games, creators of the Forever Lost game series is back this week with another of its excellent original adventure games called A Short Tale. You take on the role of a man named Jason, who has just returned to his childhood home, years after something tragic happened to his brother Ben. He enters Ben’s bedroom and all the “regret, pain and blame come flooding back”. He wishes that he could go back to a time before it all happened and repeatedly chants “I wish I was small”. Feeling sleepy he lays down, only to awake, feeling strange and finds himself tiny and trapped in his deceased brother’s old bedroom. Unable to reach the door handle he must find a way out with the help of the toys and things in the room. A true escape the room scenario, the entire game pretty much takes place in the single room. You are immediately drawn into the story and I found this to be one of Glitch’s most challenging adventures yet, as there are some very tricky puzzles. In all, I think it took me somewhere in the 6+ hour range to complete, but that doesn’t include the time that you’ll be thinking about the puzzles while you are away from the game (a sign of a great PnC adventure). There are lots of nice aha moments as you put the pieces together to solve a puzzle which then leads to a solution for several more puzzles, before you inevitably get stuck again. A Short Tale is another fine entry in the Glitch Games catalog, just be prepared for a challenge. 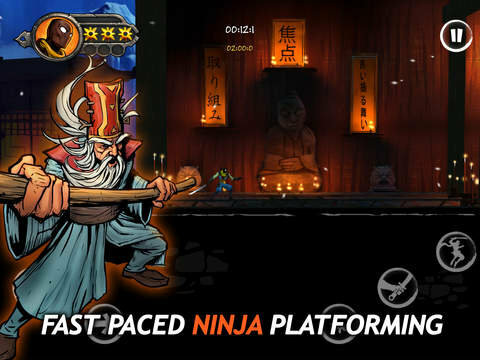 In early 2014, Crescent Moon Games and developer Dead Mage released the ninja arcade platformer Shadow Blade. The game was met with decent reviews, but many thought the levels were a bit too short. When Dead Mage developed the game for the PC, they made some improvements to the gameplay and released on Steam last August. Now Crescent Moon Games has just released this same new and improved version of the game called Shadow Blade: Reload on iOS as well. This app replaces the old release, but the gameplay has been improved with longer levels, improved graphics, and some cool new stylized enemies. If you haven’t played the Shadow Blade before, you’ll be glad you waited. If you already own the original, then check out the trailer on page 2 of this post to get a peek at all of the improvements and consider buying this new and improved release. 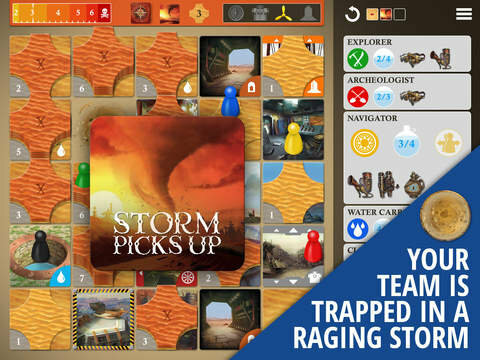 Finally, in 2011, Button Mash Games brought Matt Leacock’s award-winning cooperative strategy board game, Forbidden Island to the iPad. Two years later, Leacock and Gamewright released Forbidden Desert, his a thematic sequel to Forbidden Island, in which 2 to 5 adventurers try to “survive in a desert while trying to recover the pieces of a legendary flying machine buried under an ancient desert city”. Having been a fan of BMG’s first port, from the moment Forbidden Desert was released in physical form and I saw it played on TableTop, I was hopeful that we’d see another great digital port and this week Button Mash Games really delivered. The Forbidden Desert iPad app is a stellar re-creation of the physical game with some nice little flourishes and animations to add to the mise-en-scène and give the game an almost cinematic quality. Like their previous release Forbidden Island, there is no online play (which would be tough to incorporate well in a cooperative game anyways), but a single player can easily control multiple adventurers or multiple people can play around the same iPad, each taking on one or more roles. Having never actually played the physical game before, I was grateful for the detailed tutorial which leads you right into your first game, as well as access to the complete rulebook. Even at the easiest difficulty option, Forbidden Desert is a challenging game. While I’ve only played it (albeit numerous times) single-player so far, with me controlling 3-4 adventurers, I love the strategic gameplay it offers and planning out my moves to take advantage of the various adventurer’s special abilities. Just when you think you are going to succeed, mother nature throws a curveball and the best laid plans are quickly foiled by sand storms or the blistering heat of the sun which wipes out your team’s water supply. A much less forgiving game than its predecessor, I highly recommend picking up this beautifully crafted, portable and polished digital edition of Forbidden Desert. That’s all I have for you this week, if you live in the US, have a happy long weekend and play some games.